Growing up with Superman D.C. Comic books before the advent of any Superman movies there was always the fondness for the incorruptible hero with super powers. Though my atheistic world view was with me even as a young man, I was always attracted to virtue. Though mainly in the virtue of others and not following through with virtue in my own life. Dreaming of having super powers to be able to stop evil, yet not willing to stop the evil in my own life. For me there was always the dichotomy of admiring virtue, but not pursuing if for my self other than brief periods of stoic attempts. Villains with similar powers to Superman did not make me wish for their powers, it was really those powers with virtue that really made me want them. That paragraph in the book got me thinking on the word “super” whose origin is from Latin meaning above or beyond. To be supernaturalized men is to live a life of grace. To be docile to the work of the Holy Spirit. To work to limit and remove the obstacles to grace. To let sanctifying grace the vital principle of the supernatural life to build upon nature. 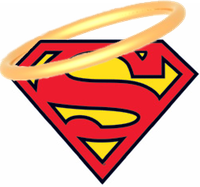 But there is one great difference between Superman and the Saints. I will never fly like Superman and be faster than a speeding bullet. Be more powerful than a locomotive or able to leap tall buildings in a single bound. But I can be a saint. I can overcome my inner “Lex Luther” and with the help of the life of grace in the life of the Church. I wanted to live the life of virtue as an atheist, but the natural virtues are not enough. Thankfully I don’t have to depend on my own abilities sorely lacking as they are “I can do all things in him who strengthens me.” (Philippians 4:13) Thus I look forward to Lent not for what I avoid, but for what I will gain. So please pray for me as I pray for you. OH! What “I” would give for an Eternal Moment with Good Old Dad!